Rep. Barney Frank (D-MA) spoke at the Graduation ceremony Sunday at the University of Massachusetts Dartmouth. Hubie Jones, a civil rights pioneer was also honored at the ceremony and Rep. Frank made a joke which many in the audience found offensive. 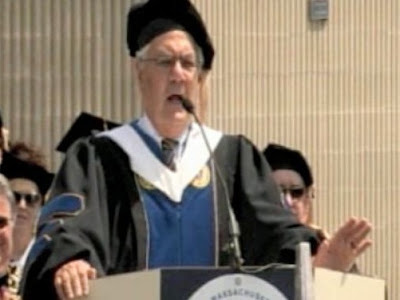 In an obvious reference to Trayvon Martin, Frank joked that, "... and Hubie, I think you now have a hoodie you can wear and no one will shoot at ya ..."
One of the students included in the news video (above) interviewed after the ceremony displayed multiple excellent examples of body language tells of disgust as she also vocalized her opinions of Barney Frank's joke (0:54, 0:55, 0:57 - 0:59 and 1:00 - 1:01). Particular nonverbal facial signals of disgust (most, but not all of which are seen in this example) include: wrinkles (muscular contraction) on the bridge of the nose, accentuated and deepening nasal-labial furrows on the side of the nose, protruding of the lower lip, raising of the upper lip with (+/-) protrusion, tightening of the area between the upper lip and nose (the "mustache area"), flaring of the nostrils, lowering of the eyebrows, crow's feet formation/accentuation on the lateral sides of the eyes, dynamic chin wrinkling and a relaxed forehead. Analysis # 1491: Barack Obama on Trayvon Martin "If I Had a Son, He'd Look Like Trayvon"